Cool inverse image effect with material? Hi, I am wondering if it's possible to achieve this effect with a material applied to an object? Does anyone know how this might be done? 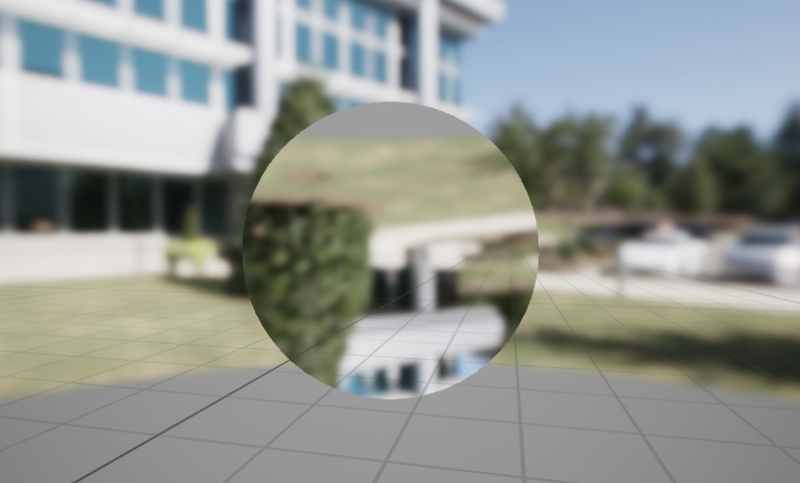 PS, Just wanted to clarify; the idea is that it reflects the entire environment and not just an hdri map. If you at it, you can also alter color of sampled pixels so you can play around that too if you want. Is there a way I can control the position of the image to align the horizon? Yes as long it not goes over the screen, all you need is to modify UV map as i did in way you want. UV is like a texture (but it not really a texture, you can not freely sample it) which contains X coordinate on red color and Y coordinate on green color to sample, between 0 (start of texture) and 1 (end of texture), and you can sample between pixels, GPU will interpolate the color values (this makes shader work independently from screen and texture resolution or filtering settings). 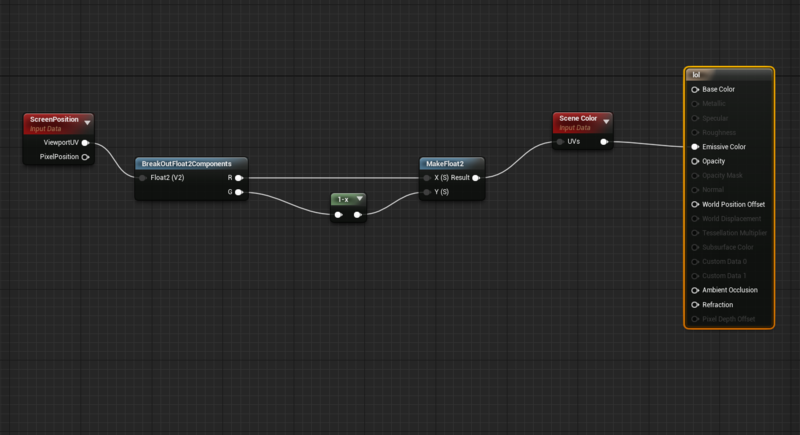 Normally mesh contains that data of it's vertices to sample texture on right point of the mesh. What we getting here is UV map of entire screen as scene Color sample by screen position. You can see how it looks like by directly plug in to emissive color, you will se red green gradient mixed together. As for shader UV map is like a 2 color data you can alter it same way as you do pixels in material and change sampling position, so for example if you divide Y (green) axis by 2 it will be stretched Y axis by twice. You can also for example do somehting more complex take normal map which has angle data to displace UV map by adding normal map (probably will require some corrections to) to make engraved glass refraction effect, you can do anything as long if it's on bound of the screen and it possible with math and data that shaders have. lighting segestions for an underground city. Attaching a global trigger to a material. What is the use of DitherTemporal material node?